One of the great things about jazz is that it’s so open. You can’t just “sit in” with the orchestra when it’s playing Beethoven Five, but in jazz you get to play with different people all the time. It keeps the music fresh and edgy – makes you feel like you’re part of something bigger. It’s especially good when you get to hear great players perform your tunes. This is what the photo above is about. 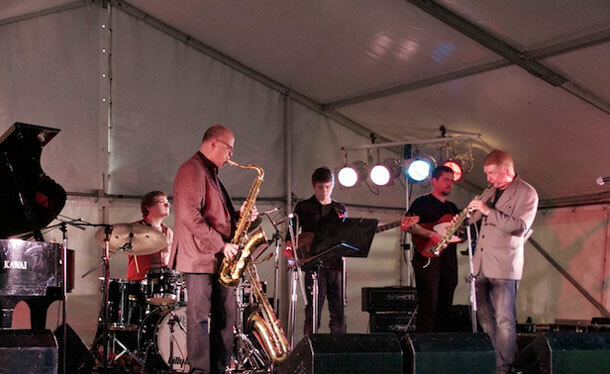 It shows yours truly gigging at the Wangaratta Jazz Festival in Melbourne, Australia in 2010 with Bob Sheppard. Bob is an LA-based sax player and gun improviser, whose output includes work with Chick Corea, Herbie Hancock and Michael Brecker’s Quindectet tours. You can find out more about him from his website www.bobsheppard.net. I first met Bob when he toured Australia in the ‘90s as the featured soloist with Mike Stern’s band. When I heard he would be at Wangaratta with Kurt Elling, I asked him to play my set as well. We played (my) acoustic/fusion originals – no standards. It was a good example of jazz’s openness; no rehearsing or talk about the music for the guy sitting in, just perform the tunes cold and solo straight up. This audio is of Bob doing exactly that on a tune of mine called Silhouette. It’s a ballad with a loose tango feel and some unusual harmonic movement, then a kind of heavy cadence that you might hear in a pop tune. Bob solos first and gets inside the tune straight away. Like all great improvisers, his soloing speaks to the head and the heart. In this excerpt you hear that in the lyrical economy of his approach to the tune’s quirkiness and with the emotional force that he plays that final cadence. My solo follows and it’s interesting to compare the two. I’m hearing more happening over the changes, so my solo is busier. But getting inside the changes like that means that maybe the ideas don’t carry as much weight – more head than heart. I heard more clarity in Bob’s solo and liked the balance it struck. I’m going to explore that balance more in the way I play this tune. It was great to hear Bob up close again – to play with him and hear him doing his thing on my tunes. Long live the openness of jazz!